I had the ham and bacon omelette. Also ordered a side of potatoes. The restaurant is not large and it's usually crowded on a Saturday morning. You order at the counter and get a number. They deliver your food to you when it's ready. We enjoyed almost all of our choices for breakfast. The sausage, fluffy scrambled eggs and French toast were tasty, but we made the mistake of asking about the Belgium waffles that were sharpied off the menus. The waffles were literally why we selected this restaurant, so we asked. She said they could do them even though usually they just have them on the weekends. Unfortunately, we didn’t understand these had been premade and weren’t going to be freshly cooked like a typical restaurant would do. The food did nourish us for a nine mile hike so it was great fuel. We just wouldn’t ask for the waffles again. First visit and it was wonderful. The staff gives a warm welcome and great service. The coffee is excellent and locally roasted. The three egg omelets are pretty to look at and delicious to eat. You can’t go wrong here. And for the sweet tooth’s there are plenty of tempting pastries in the case! 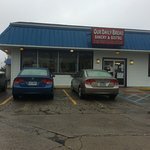 Delicious breads and baked goods, friendly service, hearty portions and good coffee! Definitely recommend a stop. Got the Greek omelette and greek bagel, both delicious. 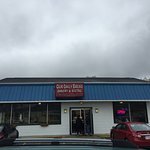 My wife and I recently discovered Our Daily Bread on 4th Street in Salem, VA. It’s not to be missed! Been to Our Daily Bread Bakery and Bistro Salem? Share your experiences!